Having integrated providers (ESS & HCC) managing both the Emergency Department and Hospitalist/Inpatient programs makes practical sense. 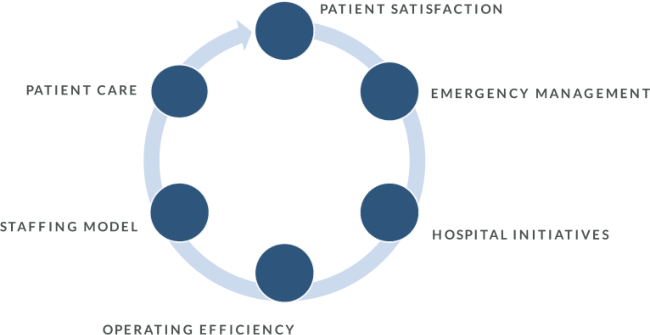 All ESS’ programs are designed to seamlessly provide cost-effective and patient-oriented continuity of care. But a dual program take ESS’ dedication to cooperative patient care to an entirely new level. If your facility has the volume to support a Hospitalist program, ask us to show you the numerous ways a customized Dual program can benefit your facility. "We have worked with Emergency Staffing Solutions since 2005 and we are quite satisfied with the quality of services they provide. The support staff is very accommodating to the hospital's needs and the needs of our local physicians. Shelley Stewart, Director of Client Relations, is our primary contact and she is a joy to work with. Shelley is quick to help and visits regularly to ensure that ESS is meeting our expectations. Overall, we are very satisfied with ESS and I highly recommend them for your ER staffing needs. If you would like to visit with me personally regarding Emergency Staffing Solutions quality service, feel free to call me at (432) 758-4898." "Emergency Staffing Solutions (ESS) has been staffing the Emergency Department of Ashley County Medical Center for several years providing 24 hour, 7 day a week coverage. ESS staff are very responsive to our needs and our requests. The Emergency Department Medical Staff proves to be very professional, capable, ethical and easy to work with in their roles. Management staff of ESS have worked diligently with us to improve quality care and patient satisfaction in our Emergency Department. Quality, timeliness and patient satisfaction are all important factors to consider in providing Emergency Department staffing and I have found ESS working diligently to orient the professional staff to the proper goals. I am pleased to offer my recommendation of ESS for consideration in other hospital Emergency Departments at this time. I welcome any questions about this service provided by ESS by having you contact me at (870) 364-1271."